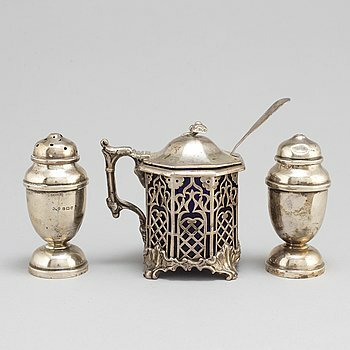 3 silver salt cellars, Moscow 19th century. 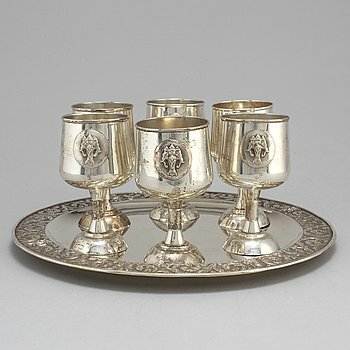 3 silver vodka cups, 18th/19th century. SVEN NYBERG, a silver beaker, Varberg 1778. A pair of silver salt cellars, mark of A Röymand 1782 and J Jensen 1844, Copenhagen. A silver wedding cup designed by Helge Lindgren. K Adersson Stockholm 1943. J TOSTRUP, 6 enamel and sterling silver dishes, Oslo Norway 1950/60s. 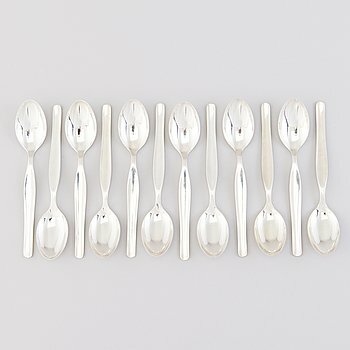 ANDERS NILSSON, 12 silver fruit knives, Lund 1904-5. 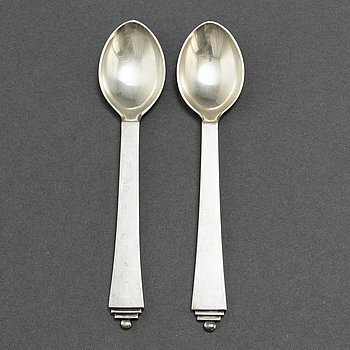 Five Late 19th Century Russian Silver Spoons. A first half of the 19th Century silver deep dish with a secondary lid. CLAËS GIERTTA, a sterling silver bowl, Stockholm 1984. LARS ÅKERBLOM, a silver beaker, Gävle 1785. WIWEN NILSSON, a sterling silver note book. Lund 1957. A silver creamer, mark of PE Sundberg, Karlskrona 1830. Five silver boxes and a salt shaker 19th and 20th Century. 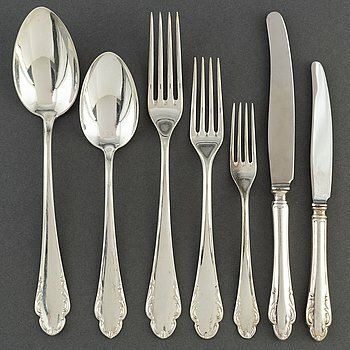 Four pieces of 20th Century silverware. A silver plated tray from the 19th century. ROLF KARLSSON, a siver bowl, Grillby 1986. A mid-20th Sovjet Union silver tea glassholder and two spoons. A Russian silver confectionary / bread basket, assay master Andrey Antonovich Kovalsky, Moscow 1854. 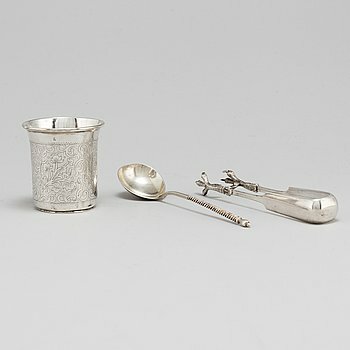 Two Finnish 19th Century silver Beakers and a Creamer. 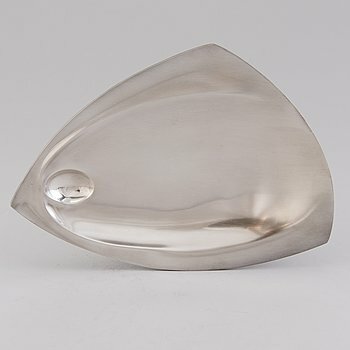 A silver plate by GAB Stockholm 1937. A three piece late 19th century Central European silver (800) coffee set. A Finnish Silver Serving Plate, Helsinki 1936. SILVEROBJECTS, 6 pieces, Tallinn and Russia, late 19th century. A Finnish 19th Century Bread Basket, marks of Fredrik Tiander, Loviisa 1862. A silver tea pot by George Fox, London 1865. A pair of silver sauce bowls by Johan Petter Grönvall, Stockholm 1821. 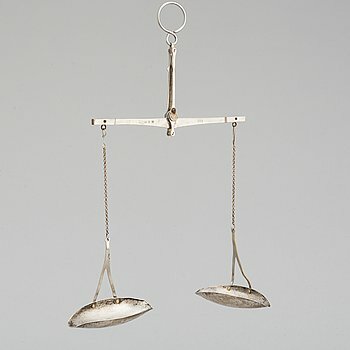 A Swedish 20th century sterling brosch mark of Wiwen Nilsson Lund 1966 weight ca 15,1 gr, length 7 cm. 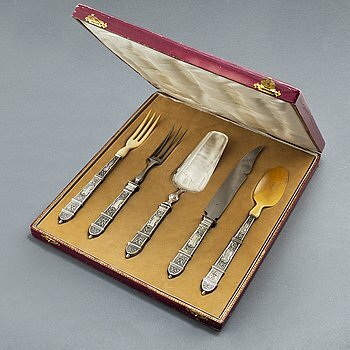 A 58-piece 'Chippendale' silver cutlery service, 20th Century.